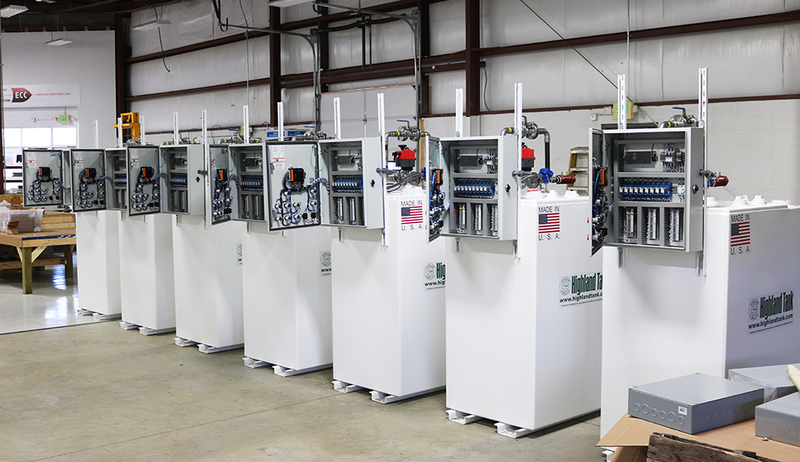 Production of day tank controllers at Electronic Control Corporation’s facility in Westminster, MD, USA. 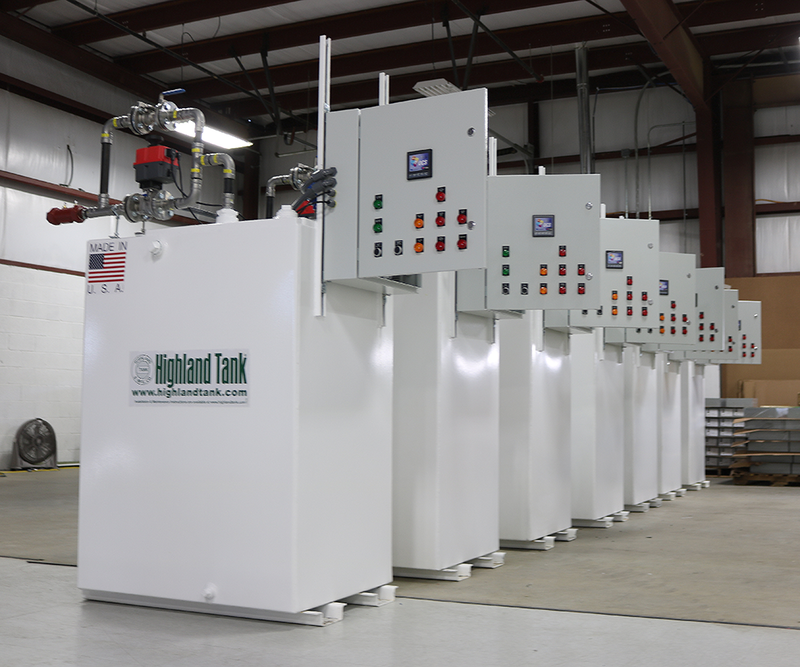 ECC-Automation was contracted by Tanks Direct to engineer and manufacture customized automated electronic systems for day tank level control and diesel fuel transfer. The twenty nine day tanks hold diesel petroleum for generators used as backup power systems. These components are being placed within the 427,000 sq. ft. MCC-1 building, purposed as a data center. It is the first of five being developed for the information technology-focused Manassas Corporate Center in Prince William County, VA. The corporate campus houses a dedicated 200 MW redundant substation with 230 kv transmission supply lines from separate substations. It also has a redundant fiber optic duct bank (FODB) put in by DuPont Fabros Development. The entire diesel fuel supply system is configured to house two underground storage tanks with larger amounts of petroleum that feed each day tank throughout the building. An additional process in the day tank fuel system is the periodic transfer of petroleum to a diesel fuel polishing tank. The polishing process removes emulsified water from the diesel fuel that is absorbed over time due to modern additives. This keeps the fuel in prime condition for use in the backup system. Fuel level monitoring of each day tank is handled with mechanical floats and electronically controlled gauges. Each time even a small power outage window occurs, the backup system is employed and uses diesel fuel from the day tanks. Fuel in the day tank is maintained at a predetermined level to ensure the availability of power for the data center through its disaster recovery process. The electronic controls of these floats can monitor day tank level, but not the control of the signaling and pump process for petroleum transfer. Once again, Electronic Control Corporation has innovated a solution for the automation in cutting edge power redundancy. They designed and built the automated day tank control system to request the fuel and start the pump for transfer. This included programming relay logic and HMI functions as well as integration into the BMS. To reduce logistical time and manufacturing costs, Tanks Direct delivered the completed day tank system to ECC-Automation’s facility. ECC then installed a control panel on each day tank prior to shipping them to the building site. This also allowed them to save time in applying their strict quality assurance process. The challenges of this day tank automation project also called for seamless integration into the Manassas Corporate Center building management system (BMS). 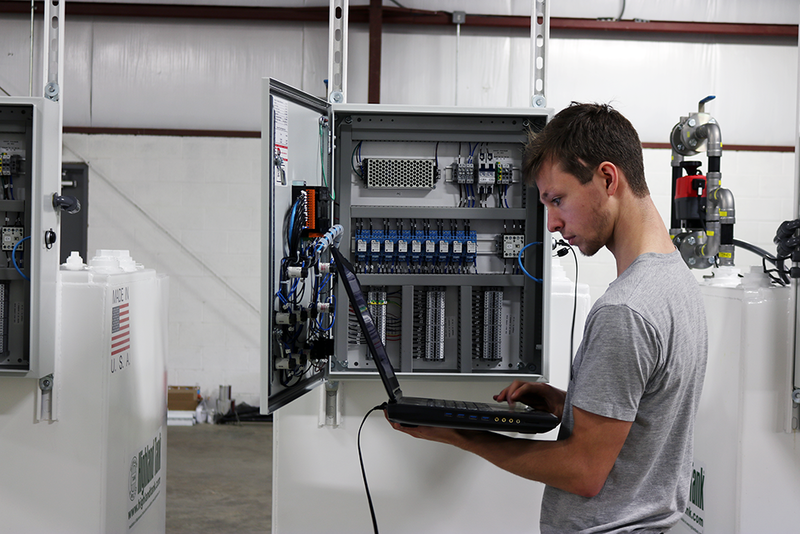 Many electronic control projects now include this requirement, as BMS and building automation systems (BAS) advance to include comprehensive oversight of industrial components within a facility. Electronic Control Corporation has designed, manufactured, and installed complete day tank control systems, as well as BMS / BAS. 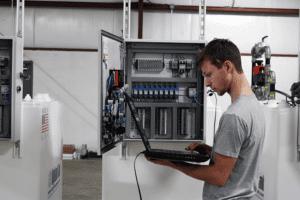 Some still believe that machines and equipment operating mechanically should still be hard-wired and, or analog rather than employing a programmable logic controller (PLC). There, nothing challenges this thinking more than the building of a modern data center, especially one that is completely digitized and purposed for cutting edge power and processing. Since the day tanks fueling the backup generators are controlled by a BMS running PLCs, this also dispels the case against the more traditional mindset. 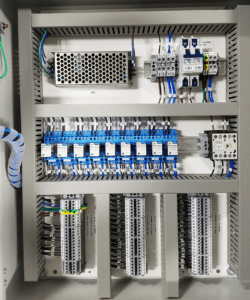 Benefits through less relays, reduced troubleshooting steps, and more bolster support for PLC-based automation control of mechanized modalities. An XL4 series controller by Horner Automation Group was used for each day tank controller. Their cscape software provided the API to program relay logic (still used in PLCs for mechanized machinery) for monitoring levels and the sequencing of the day tank petroleum transfer. Each day tank fuel controller would call for fuel from the BMS that controlled the main USTs and backup fuel generator system. An ECC engineer uploading software that includes setting up password privileges and turning on I/O for various tests. The diesel fuel polishing process also required the programming of initiating the opening of the day tank fuel valve and alert the polisher that fuel is on its way. A key enhancement, provided by ECC engineering, was the monitoring of the normal open / close position of the day tank fuel float. The programming sequence included the ability to identify whether or not the float was stuck and, if so, send an alert to the technician. 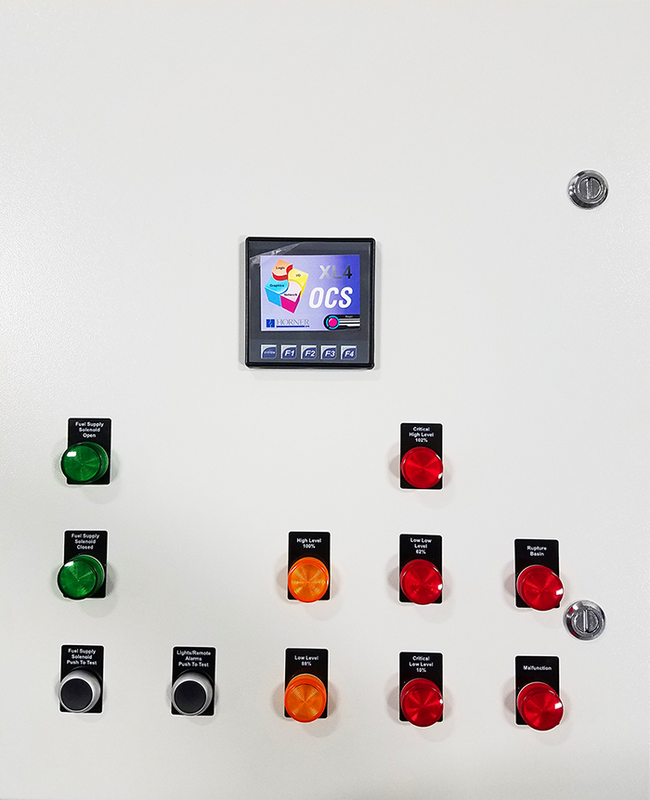 Along with the sequencing of process controls, Electronic Control Corporation software engineers programmed outputs and developed the HMI screen functions. A constant readout of 4-20 mA required a scaling algorithm that allowed the output of the day tank diesel fuel level in percentage of gallons. The HMI displays when it is turned on, opened and indicates in blue that the tank is filling up. Alerts sent out to the BMS, which could then broadcast through virtual channels. Part of the key function for this system is it’s localized automated control system for each tank, but then integrated into the BAS for top-level monitoring. Electronic Control Corporation provided another unprecedented innovation by allowing the adjustment of the 4-20 mA scale. This is highly advantageous in a scenario where the float level sensor is not exactly set and may be off by 1/4″ or 1/2″ from the bottom of the day tank. The control system can then compensate for this irregularity and adjust the scale to show the right float level. 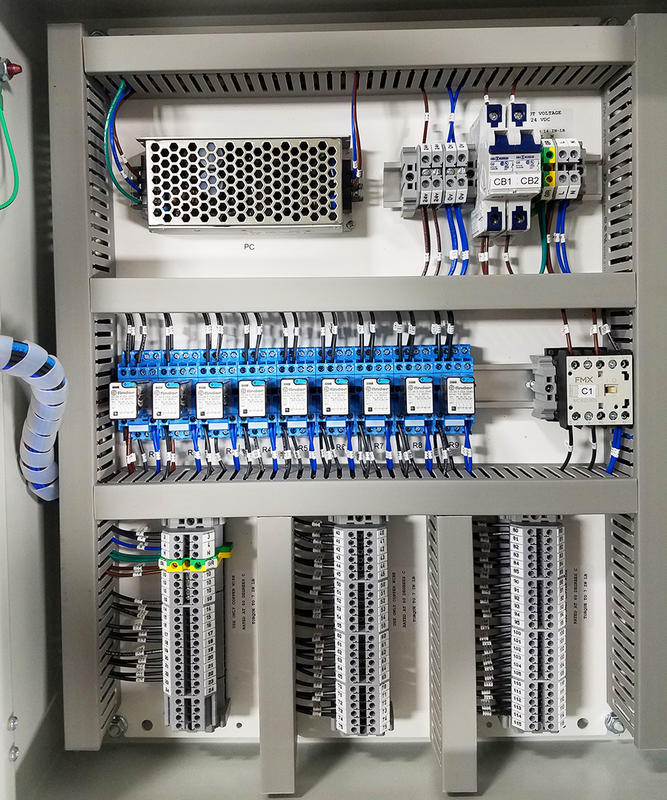 This project is yet another demonstration of ECC-Automation’s ability to provide a timely, custom electronic control solution. An innovative, high quality automation product was provided, based on the customer’s challenges and requirements. 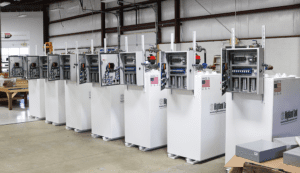 Engineering and manufacturing services were offered at fair pricing, with a faster lead time.